Aksel Rykkvin is thirteen-year-old Norwegian treble who has become something of a phenomenon. 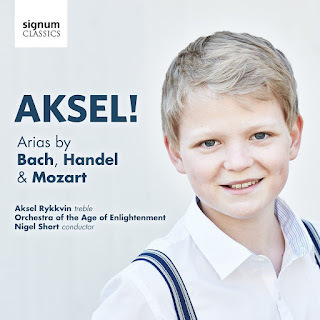 This disc on Signum Classics, recorded in January 2016 thanks to significant crowd-funding, sees Rykkvin performing arias by Bach, Handel and Mozart with the Orchestra of the Age of Enlightenment, conducted by Nigel Short. And it certainly isn't a disc of easy pot-boilers, Rykkvin includes some pretty challenging music including Bach's Jauchzet Gott in allen Landen and Ich folge dir gleichfalls (from the St John Passion), Handel's Eternal Source of Light Divine and arias from Joshua, Alcina, Rinaldo, Messiah and Samson, two arias from Mozart's Le nozze di Figaro and the Alleluia from Exsultate jubilate. One of the interesting things about the programme is that most of the Bach arias, and the arias from Handel's Alcina were in fact written for the treble voice, but rarely sung like that nowadays. Aksel Rykkvin (born 11/4/2003) was a member of the Children's Chorus of Norwegian National Opera & Ballet, and Oslo Cathedral Boys' Choir. His recent appearances have included a role in Rolf Wallinn's new opera Elysium which premiered in Oslo this year. He has a bright, forward-sounding voice which has an enviable ease up to the top with only a very slight tightness in the upper notes. But what distinguishes him is his strong technique so that, as with more mature soloists, you listen to what he does with the music rather than whether or not he can negotiate the notes. That the music on the disc takes no prisoners is indicated by the opening aria Bach's Jauchzet Gott in allen Landen which is taken at quite a lick and sung with a more than creditable degree of bravura. The passagework in some of the arias is slightly less than perfect, but a big of smudginess here and there is something which happens with many singers three times Rykkvinn's age. Ich folge dir gleichfalls (from the St John Passion),is similarly poised and despite the complexities of the vocal part, Rykkvin manages to not only get through it with honours but he bring a shape to the music. Bist du bei mir is simply charming, as is Angenehmer Zephyrus, and Quia respexit from the Magnificat in D major is poised and beautifully controlled. The two arias from Handel's Alcina bring out the sub-theme of this disc, the arias (including most of the Bach ones) originally written for the treble voice to sing. But puberty occurs so much earlier nowadays (during Bach and Handel's day the onset of puberty causing the voice to break occurred between 16 and 19), so this means that few trebles are able to sing this music. Rykkvin's Handel singing is impressive, and he brings a wonderful brio to Barbara! io ben lo so from Alcina, whilst creating a creditable sense of emotional atmosphere and a lovely sense of line in Lascia ch'io pianga from Rinaldo. Eternal Source of Light Divine brings out all that is best in Rykkvin, a beautiful clarity of tone, superb top note (concert A flat), very fine sense of line and a feeling for the long paragraphs in the music, but it has to be admitted that his sung English is nowhere near as clear as his German or Italian. Handel tended to use female sopranos for the Messiah solos, but it wasn't unknown for him to use trebles and here Rykkkvin gives us a finely graceful How beautiful are the feet, and a rather brilliant Thou art gone up on high, followed by a joyful account of Let the bright Seraphim from Samson which simply makes you forget his age completely. 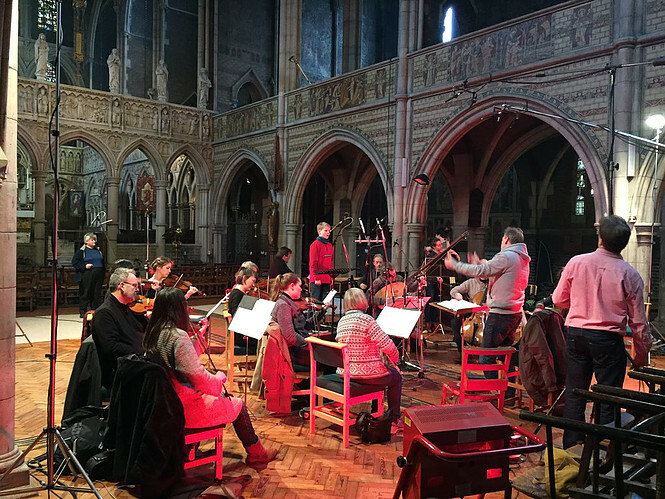 Had I but Jubal's Lyre, his final Handel aria, demonstrates the sheer technical control he is able to achieve. Mozart's Cherubino in Le nozze di Figaro is played by a woman, though the character depicted is an adolescent boy. 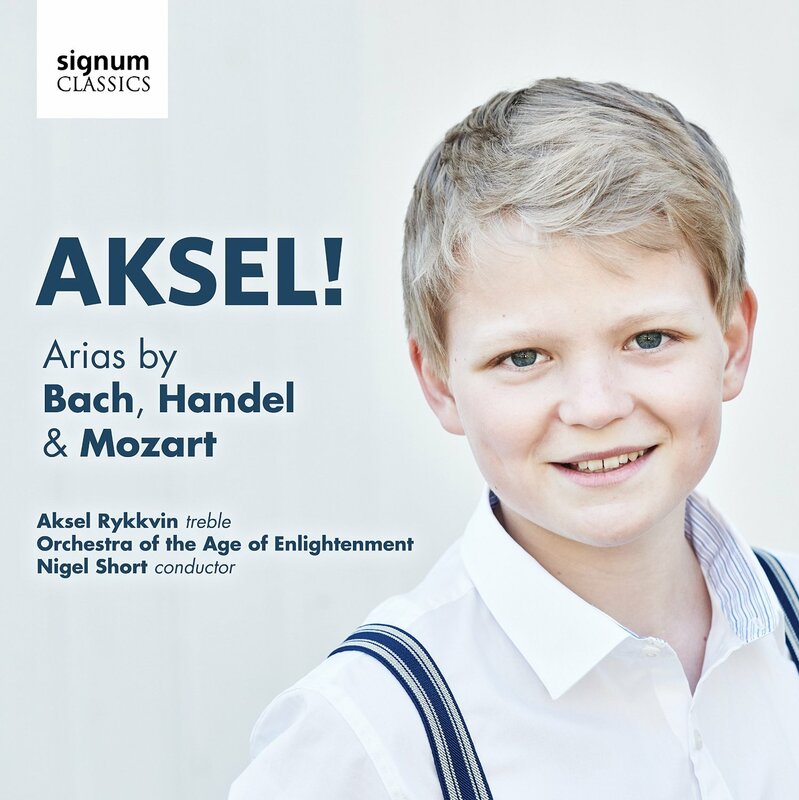 The sheer perfection of Mozart's music brings a challenge to all performers, and here Aksel acquits himself with credit. Voi, che sapete though well sung does rather lack emotional depth, but Non so piu is engagingly vivid. He concludes the recital with the Alleluia, from Exsultate Jubilate sung with superb confidence. Throughout Nigel Short and the Orchestra of the Age of Enlightenment accompany with poise, and give us some lovely instrumental solos in the many arias. This is a lovely disc, a record of a voice which will inevitably change and no-one can predict that the adult Aksel Rykkvin will sound like. But the disc is more than simply a record of a moment, Rykkvin's not inconsiderable talents mean that the disc can simply be enjoyed in its own right.